Ultra-Masculine and bold, we recommend the G7 Men's Wedding Band for the polished, sophisticated and sharp man who knows what he wants. This style is ideal for the confident gentleman who feels as comfortable in a three-piece Armani suit as he does in jeans and a t-shirt. Available in yellow gold, white gold, or the ultimate in platinum, this 7 mm men's wedding ring boasts solid geometric lines with 0.36 ctw G color, SI1 clarity diamonds. Men who prefer this style often admire sports cars designs such as those found in the portfolios of Mercedes, BMW, and Tesla. Low-key with an air of understated elegance, the M6 Men's Wedding Band is ideal for the man who appreciates a classic, refined style. The clean lines and masculine contouring of this ring is ideal for any personality. Because M6's design is low-profile, it fits in well with the most demanding of professions—even ideal for a man who often works with his hands. Available in yellow gold, white gold, or platinum, this 6 mm men's wedding rings starts at an affordable price. Men who prefer this style often admire sports cars designs such as those found in the portfolios of Jaguar, Audi, and the Classic American Muscle Car. Show all those ladies he's taken with the bold and racy ZG6 Men's Wedding Band. Ideal for the man who has it all and isn't afraid to flaunt it, this 6 mm men's wedding ring boasts 1.00 ctw of G color, VS2 clarity diamonds. Available in yellow gold, white gold, and for gentlemen with exquisite taste—platinum, this wedding band will make him want to cross the finish line even faster. Men who prefer this style often admire sports cars designs such as those found in the portfolios Ferrari, Lamborghini, and Bugatti. 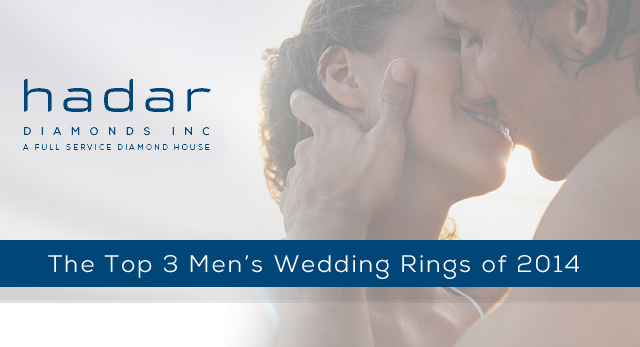 All of Hadar Diamonds Men's Wedding Bands can be customized to fit his unique style and ladies engagement rings. For more savings, consider adding clarity enhanced diamonds to your jewelry over non-enhanced diamonds.